Ryan Caine spent the holiday season in the hospital, with his family by his side, including parents Russ and Janet Caine. NBC 7's Artie Ojeda reports from Ryan Caine's personalized Christmas party in Rancho Penasquitos. Janet Caine told NBC 7 those days were dark. "You don’t want to eat; you don’t want to do anything," she explained. "You just want to function because you feel so helpless and you feel like you can’t do anything for your baby." While Ryan Caine was in the hospital, Janet Caine set up an online global prayer network. At one point, Janet Caine said there were 15,000 people across the world taking part in the coordinated prayer session for her son. Slowly, with round-the-clock medical care and determination, he grew stronger. On Jan. 24, Ryan Caine miraculously awakened from his coma. He turned to his mom and asked, "Did I miss Christmas?" "We said, 'No, Christmas can happen anytime, and it is waiting for you at home,'" Janet Caine recalled. The Caine family is big on Christmas. Each year, they join their neighbors on Ellingham Drive by decking out their home in elaborate holiday decorations inspired by the characters from "Suzie's Zoo." Sure, Ryan Caine had missed the festivities in real-time but thanks to the spirit of his neighborhood, family and friends, his Christmas would still come — only a little bit late. After nearly two months in the hospital, Ryan Caine was discharged Wednesday. As he arrived home to Ellingham Drive, he was met with posters, signs and balloons made for him by neighbors, and, of course, holiday decorations. Neighbors gathered around him, singing "We Wish You a Merry Christmas." Christmas Card Lane rallied to give Ryan Caine the Christmas party that he missed. With neighbors lining the street and cheering, Ryan Caine rode into his driveway in a truck accompanied by his family. The truck was covered in bright-pink, handwritten signs that read, "Thank All of You for Your Support and Prayers." 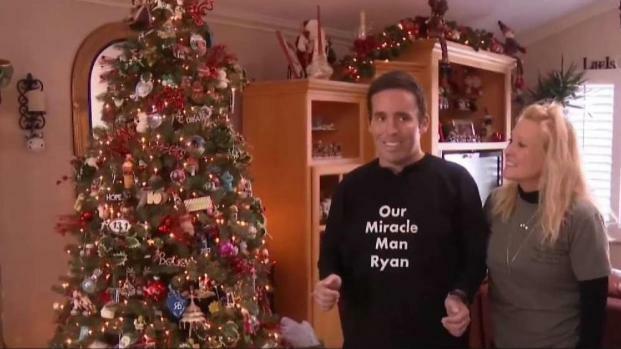 Ryan Caine wore a black shirt that read, "Our Miracle Man Ryan." Like a kid on Christmas morning, Ryan Caine's face lit up as he walked into his home. Inside, holiday garland covered the staircase banister and a trimmed Christmas tree stood in the living room with wrapped gifts underneath it. "Merry Christmas, honey," his mother said. "Look at all those presents." "Oh my gosh," Ryan Caine said. "This is amazing!" "Merry Christmas, honey!" Janet Caine said to her son, Ryan Caine, who came home to his Rancho Penasquitos neighborhood on Feb. 6, 2019, after nearly two months in the hospital. Ryan Caine, who is on the autism spectrum, is described by his family as having the exuberance of a 10-year-old. He was overwhelmed with joy as he finally got to celebrate Christmas with his loved ones. "I’m just so blessed to have Christmas still here. We can do it all year round, too," Ryan Caine said, beaming. The Caines credit doctors at Scripps Health and the incredible power of prayer for Ryan Caine's recovery. "We’re back here today because of all of you supporting him, and supporting us," Russ Caine said at Ryan's homecoming. "We can’t thank you enough." His family said the plan is for Ryan Caine to spend the next three to four weeks undergoing a health rehabilitation program at home on Ellingham Drive — a place where true magic is possible, no matter the time of year.